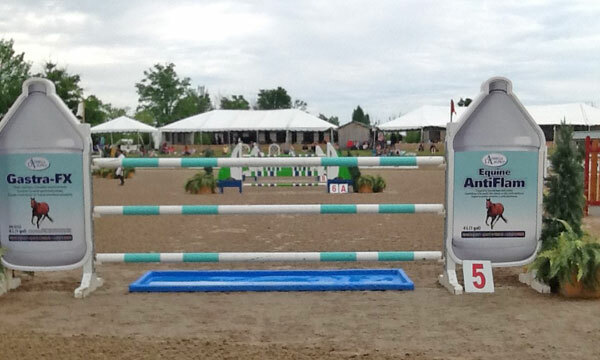 We have moved from Palgrave to the Angelstone Farm for the first event in the summer series. 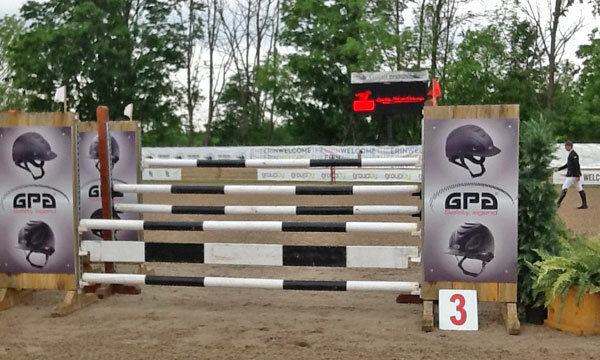 We will begin with a national level $20,000 Ride Every Stride Grand Prix. 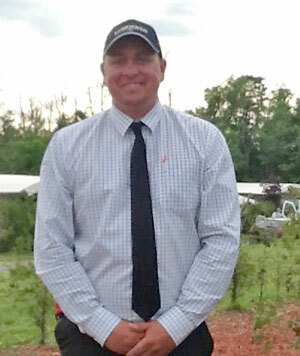 Our course designer for the week has been Chris Jones (CAN), who is new to this venue. 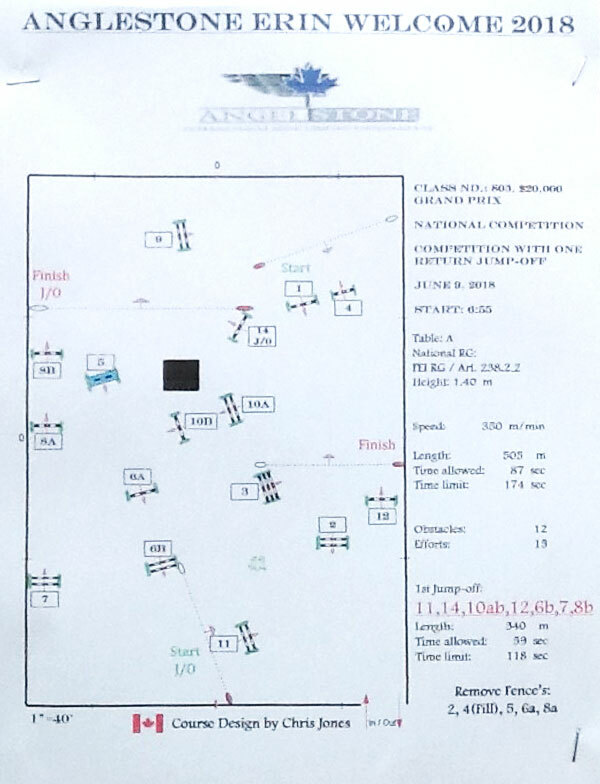 The national level grand prix can be a very difficult class for the course designer in many ways that have been discussed in past reports. The classes in the main ring this week have a couple of new and disturbing twists that need to be discussed at the conclusion of the walk tonight. 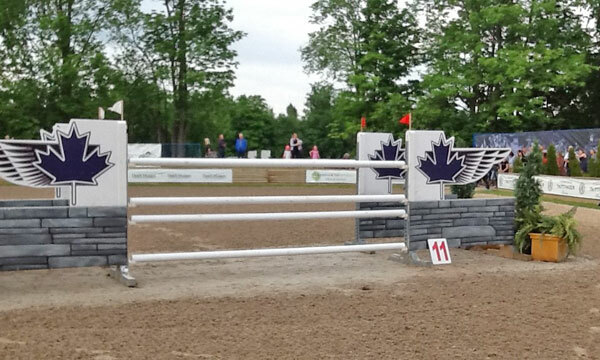 Chris has worked for many years on the Canadian circuits and in the USA and has a very good touch with courses that involve the medium calibre horses entered in this event. 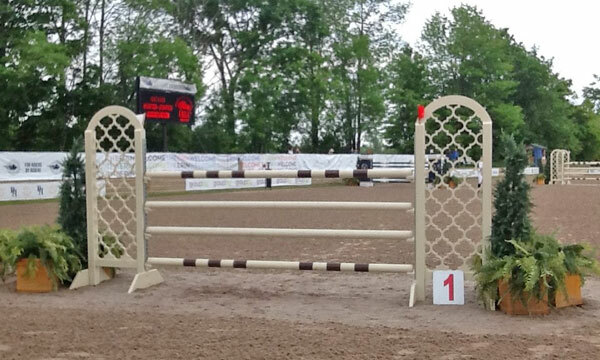 This event also combines many young riders moving up to a higher level of competition. The start list tonight will show this mix of many younger riders and a few older more experienced riders and horses. There will be 24 starters and all will compete. There is a good crowd on hand and does attest to the work done by Angelstone over the years to attract a solid base of spectators for the Saturday night grand prix. The weather is perfect. The course will show 12 numbered obstacles and 15 efforts. The TA was set at 87 seconds and after four rides it was changed to 90 seconds. There was a refusal in the second ride and we waited for three rides without a refusal to alter the TA. This is the third consecutive grand prix in our season where the TA has been changed upward and I will spend a little time at the end of the walk discussing this fact. 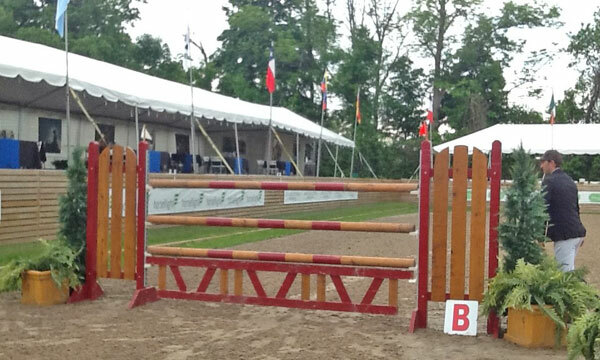 #1 vertical 1.35m or 4.2ft and this starting fence ended the evening early for one rider. #2 oxer 1.30/1.35/1.45m or 4/4.2/4.9ft and comes on a long gallop with no given distance with a soft bending right rein and was witness to two rails falling from the evening sky. 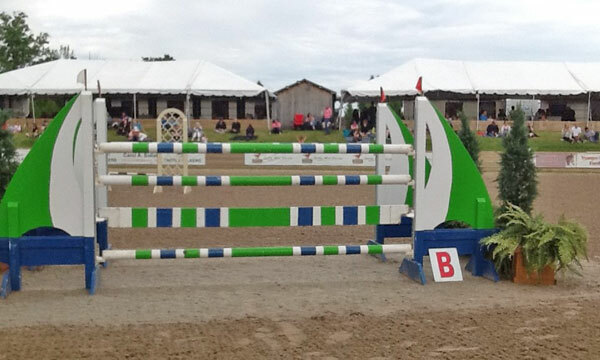 #3 triple bar .85/1.40/1.70m or 2.9/4.3/5.6ft comes away from the in-gate and on a full turn right and was literally leveled one time. #4 short pole vertical 1.40m or 4.6ft comes on the bending left rein with no given distance from #3 and created one refusal and another drive by. One pole fell to the floor. #5 closed Liverpool1.40m or 4.6ft comes from #4 on a long gallop on the left rein and the top pole splashed down two times. #6a vertical 1.40m or 4.6ft comes from #5 in a straight line with a distance of 19.20m or 63ft and got covered in sand on two occasions. 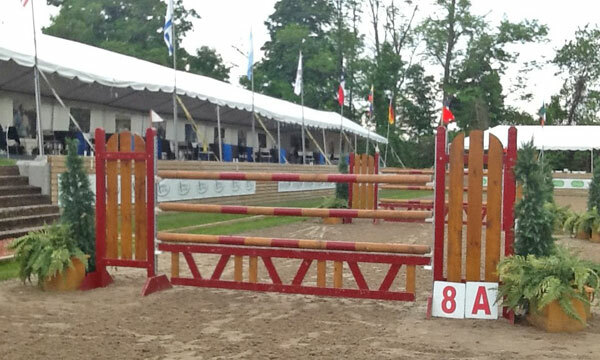 #6b oxer 1.35/1.50m or 4.2/5ft comes from #6a with a distance of 11.20m or 36.6ft and two poles and here we saw two poles find mother earth and there was one total blowout. 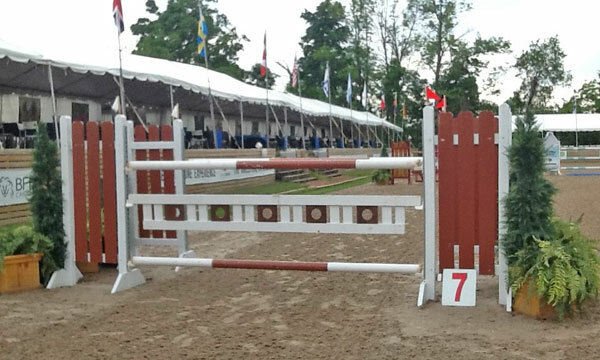 #7 oxer 1.35/1.50m or 4.2/5ft comes on a full right turn and back up the ring and the height was lowered two times. #8a vertical 1.35m or 4.2ft comes in a straight line from #7 with a distance of 21.90m or 72ft and was punished three times. #8b vertical 1.40m or 4.6ft comes from #8a with a distance of 11.30m or 36.6ft and was also punished three times. 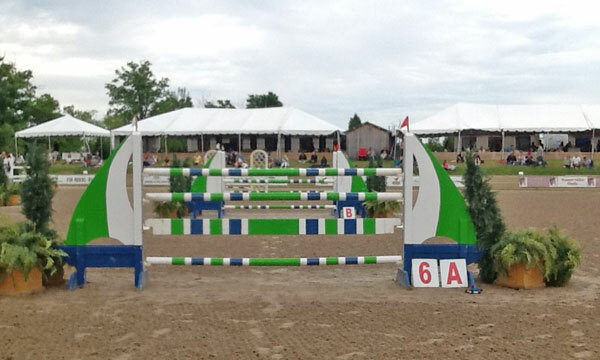 #9 oxer 1.40/1.50m or 4.6/5ft comes from #8b on the right bend and with a distance of 31.40m or 103ft was pushed to the sand floor two times. #10a oxer 1.35/1.50m or 4.2/5ft comes from #9 on a long gallop on the right rein and is a standalone test on the middle diagonal of the ring and saw two poles pushed from the top 20mm cups. #10b vertical 1.40m or 4.6ft and with a distance of 8.20m or 26.9ft from #10a and also fell to the sand two times. #11 oxer 1.40/1.50m or 4.6/5ft comes from #10b on a long gallop on the left rein toward the in-gate and was never faulted on the evening. 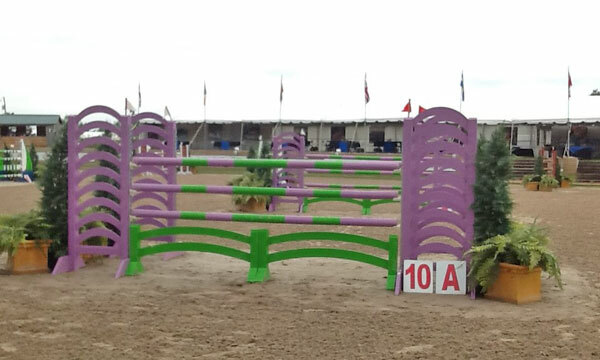 #12 vertical 1.40m or 4.6ft comes from #11 on the left rein and away from the in-gate with no given distance and also was never faulted on the course. That ends the opening round. The final tally of the first round will show that there were 10 clean rounds and one round of one time fault. 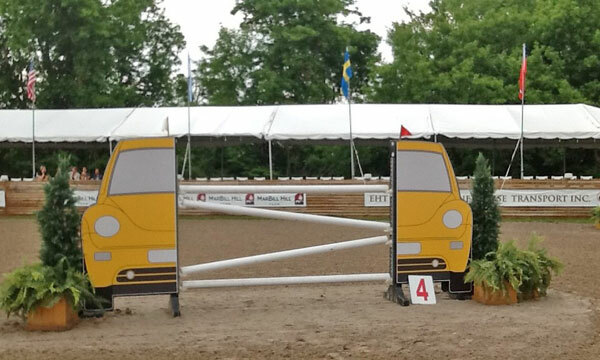 We saw five rounds of four faults and one round of eight faults and three with 12 faults. There were no falls and no eliminations, but there was one VW. There were a couple of rounds that had more faults but they will live on and compete another day. Combined with the open welcome and tonight’s grand prix Chris Jones did a very good job in giving us entertaining and fair sport. As I said earlier these are difficult classes to build and get proper results when the field is so diverse. 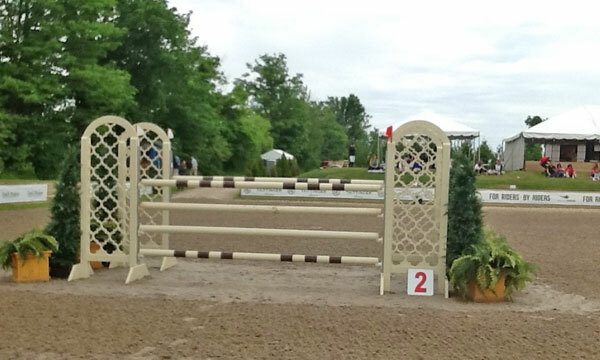 This week was made far more difficult for the course designer because the jump material was not the set of fences used over the last few years. The course designer can only create courses with the material provided by the management. The material that was provided this week was what we would call indoor jumps. The length of the poles used in the construction of 12 of the 15 obstacles was 10ft and there was one short pole vertical of 8ft. 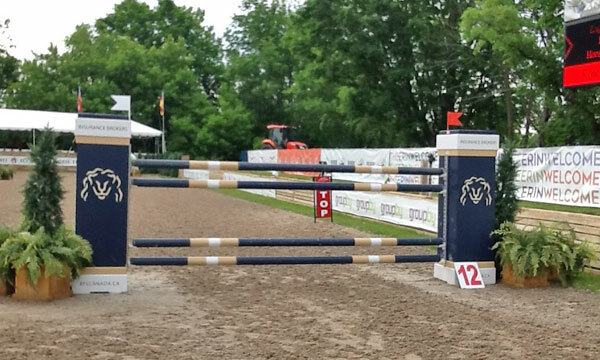 There were only three jumps of the standard 12ft. There were no yellow 18mm cups in sight but that was a good thing. Yellow cups and 10ft poles would have been a recipe for disaster. Chris used 20mm white cups and this was fair use for this equipment. In my opinion to have 90 per cent of any outdoor competition constructed of 10ft equipment is unfair to the competitors and their horses. 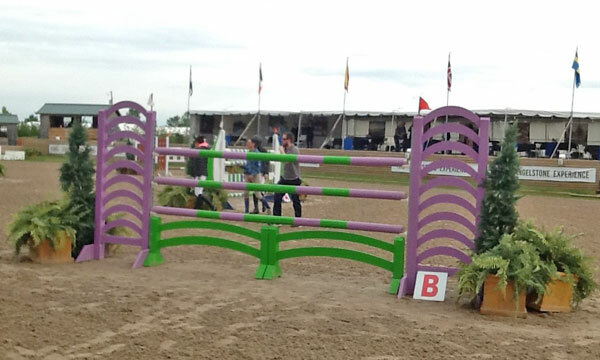 Whether the rules are national or FEI 10ft poles are used but only to provide a little variety in the tests on a course. In preparing for a week of competition a course designer will prepare in advance and not knowing the material is going to be mainly 10ft will not go over well. Even using the 20mm white cups with the 10ft poles the jumps are very fragile and they can turn a good course into a nightmare. It really makes a big difference. I hope that some changes can be made with the material for next week’s FEI 2* show. I would like to complement Chris Jones for his work this week and look forward to seeing him in the near future. 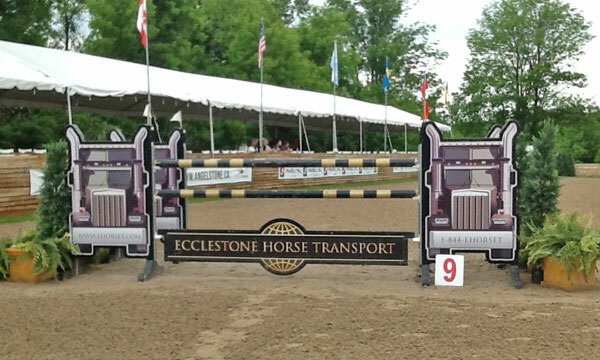 Next week we move to our first FEI 2* of the season at Angelstone. Until then I am Dave Ballard.